The MasterPath lovingly states that this conundrum does not have to continue. There is a means of spiritual unfoldment that has been with us since the dawn of creation, a system of pure spirituality that is flawless, universal, easily understood, and will most certainly restore your faith and love, not only in yourself, but in the Supreme as well. I would therefore like to convey to you, in the simplest terms possible, the essential truths of pure spirituality, allowing you to form your own conclusive insights. The common denominator in most paths is their insistence that truth and God are not within your own individual consciousness. There are over 18,000 separate paths in the world today, and very few insist that the truth is found within the temple of the human vessel. The vast percentage of spiritual endeavors direct seekers to pursue truth or a Deity that is outside themselves, one that cannot be accessed, seen, or heard, and therefore, any definite means of verification as to the integrity of their claims cannot be substantiated. All devotees are subjected to this universal dilemma, with no means of validating the purported principles of truth. The MasterPath proclaims that it is impossible to find your true self if you persist in searching outside the body. All great Saints of the past and present unequivocally state that truth, soul, the true Master, and the Supreme Deity are all located within the human body, and to look for them anywhere else is an exercise in illusion and futility. Before the Divine Deity can be found and worshiped properly, the individual must discover one’s own divine essence within oneself, which stands as the intermediary bridge between the Lord and the mind within the human vessel. If one has not realized the soul within, the mind easily takes the ascendant and leads the seeker astray. To be “led astray” means that the material, emotional, causal, or mental states of consciousness have taken precedence over the soul of the individual. The soul is our true self, while the mind and emotions are faculties given us to help serve the universal cause of liberation, and to assist in the discovery of the divine essence within us. This is the greatest distinction between a Path of spiritual truth and a path of universal mind power. The Path of truth adorns the soul, while the path of mind adorns the sensory-intellectual consciousness. The MasterPath is a Path of self-mastery. Attaining one’s Mastership is the end-all and be-all of all spiritual pursuit. The first pillar is Self Realization, wherein the soul of the human being realizes that it is first cause, created by the Supreme Deity, and identical to It in every way. Spiritual Realization transpires next, which inculcates the oneness of all life, of all paths, and the overriding realization that the Divine’s Essence creates, sustains, and directs all life. This is true whether it be the atom, molecule, plant, animal, human being, the psychic lords, angelic forces, or any form of spiritual endeavor, whether religious, psychic, philosophic, or atheistic practices. The third pillar of MasterPath is the attainment of God Realization, the reality of which no words can possibly convey. God Realization is the summum bonum of all spirituality, and is the exclusive reason why the soul entered the human body ages ago. There is no comparison between lower paths of light and the lofty ideals of the Light and Sound Teachings. This does not imply that other spiritual endeavors are not valid, nor that they should be viewed disparagingly, for all paths have their own unique value to bestow upon the traveling soul. The soul lives forever, and has been tutored by many different forms of spiritual instruction. The difficulty in unfolding one’s latent spiritual energy lies in mind’s refusal to allow the soul to take the ascendant. The mind is presently in control, and the divine purpose is to realize that the soul is the inherent spark of God, not the mind. In order to transcend the folly of the mind, the karma of the individual must be penetrated and resolved, so as to differentiate between the universal mind power and the true spiritual essence of the soul. Conventional practices such as religion stress that the human is born in sin and has only one life to live, claiming that each and every soul must accept the tenets of religious doctrine or be sentenced to hell for eternity. Most religious followers believe that there is only one means of spiritual practice for all of humankind to bring order and salvation to its chaotic condition. The followers of traditional doctrine have also been led to believe that there is only one Master for all humanity, completely overlooking that if a Master was needed in the past, how much more He would be needed now! Spiritual worship has been directed more toward the personality of the founding Saint rather than His spiritual essence, and therefore, cultish tendencies have replaced genuine worship. Upon close investigation, it is found that religion, as humankind knows it, is more the by-product of strong-willed disciples than the original doctrine taught by the founding Saint. Every true seeker should understand that “being saved” through the church will not end the long cycle of karma and reincarnation. They should also understand that attaining cosmic consciousness is only the pinnacle of mental achievement – it is not the attainment of Self Realization, as so many falsely claim. Likewise, every true spiritual seeker should realize that the truth one seeks is never outside of oneself, but always within. Seekers must find their own divinity within themselves, before they can properly relate to anything divine outside of themselves. 1. The presence of a true Guru, in contrast to a pseudo guru: A “Sat,” or true, Guru is commissioned by the Highest, while pseudo gurus are self-commissioned. A true Guru is sanctioned to initiate the soul into the spiritual Current, while pseudo gurus desire the devotee to worship the personality of the guru, or even one’s own personality. 2. The pursuit of the Sound Current, in contradistinction to the light: The Sound is the primordial Current emanating from the Supreme Deity, while the light is the vast array of mental knowledge issuing forth from the mental realms. The light states that morality, or the power of positivity, is the preferred way to attain spirituality, while the Sound unequivocally states that both the positive and negative powers are part and parcel of the universal mind, neither of which can secure emancipation. 3. Attainment of Self and God Realization before the translation of the physical body: Spiritual liberation is the goal. To be liberated suggests an ability to transcend all personal karma, which means rising above all the tendencies of the conscious, subconscious, and unconscious minds, until the soul stands alone in all of its glory. This is Self Realization. At this juncture, the soul can recognize and properly worship the Supreme Deity, and has all the spiritual qualities and attributes at its disposal to do so. The mind is literally incapable of recognizing and worshiping the Divine. The simple purpose of the Light and Sound Teachings is to offer genuine truth to those who long for its company. Contrary to religious and psychic opinion, the truths of MasterPath can be verified by your own investigation, within your own sacred temple, for no individual should take the word or promise of another without first verifying it for oneself. The truth needs no defense, and this is the MasterPath’s stance. See for yourself. True spirituality is as much scientific as it is devotional, and we should be able to prove these great truths through our own experience rather than accepting the secondhand knowledge of another. One’s individual experience proves to be enough. The pure and sincere seekers of the world are exasperated with today’s aura of spirituality, and the yearning for pure spirituality has never been greater. Yet this deepest yearning, heard as the piercing cry in the night, is being suffocated and is unable to realize itself or to quench the fires of separation and loneliness. Cultish practices abound in nearly every circle, for the personality of the leader is not transcended; the mind and its accompanying ego are not corralled and made to subjugate themselves to the dominion of soul, nor are the overwhelming majority of these worldly doctrines free of dogmatism, bigotry, and self-righteous attitudes. Rites and rituals have replaced the actual practice of truth. Books have adequately promoted the letter of the law, but have failed to define the spirit of the law in understandable terms, and the collective consciousness of the group has pridefully held itself in more esteem than the individual and his or her own realization of truth. The institution of truth lies within the temple of the third eye, not within a building in the outside world. Similarly, truth cannot be encompassed by logic or reason, as is purported by philosophical organizations; rather, truth requires the advent of individual consciousness in order to penetrate its mystery. The religious, philosophical, and metaphysical organizations of the world have usurped the power of the individual and supplanted it with their own hidden agenda, an agenda that never serves the individual, but always the collective consciousness. The MasterPath restores within the individual the power of pure spirituality. 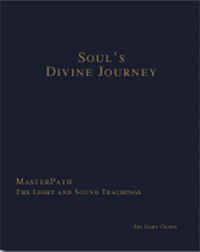 The MasterPath is the individual approach to finding the truth about yourself and all spiritual matters. You are the Master and you are the Path, and with the advent of consciousness, you will realize that you are also the truth. The truth is not far away, and only requires an inward retracing of the attention back to the third eye. If you are sincere, you can, of your own volition, verify these principles for yourself. MasterPath is a registered trademark.